This week’s Across The Block features a selection of notable prices recently achieved at various auction houses, including a signed photograph of Frederick Douglass, celadon vases, repoussé silver, American art pottery, a Guy Rose painting and much more. 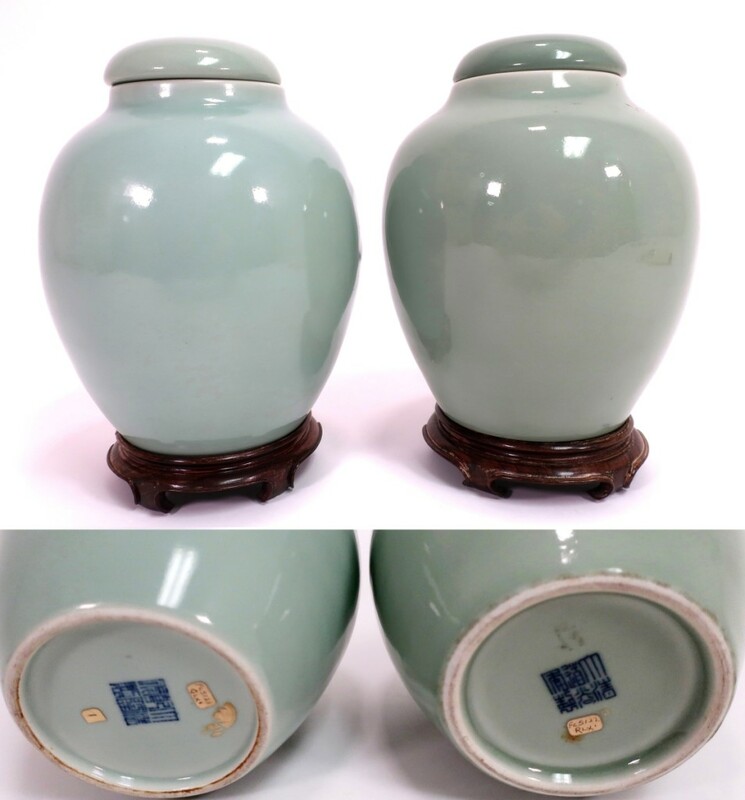 LITCHFIELD, CONN. – The top-selling lot at Litchfield County Auctions’ March 24 sale was a near pair of Chinese celadon porcelain covered jars from a private collection living in the Lombardy hotel in New York City. The estimate ($1/1,500) proved enticingly low and bidding came through several online platforms as well as from bidders in the room. In the end, a trade bidder in the room, buying on behalf of a Chinese client, won them for $40,000. For information, 860-567-4661 or www.litchfieldcountyauctions.com. BERLIN, CONN. – Nest Egg Auctions sold a lifetime silver collection on March 24. “This collection was built over the course of 70 years,” said auctioneer Ryan Brechlin. 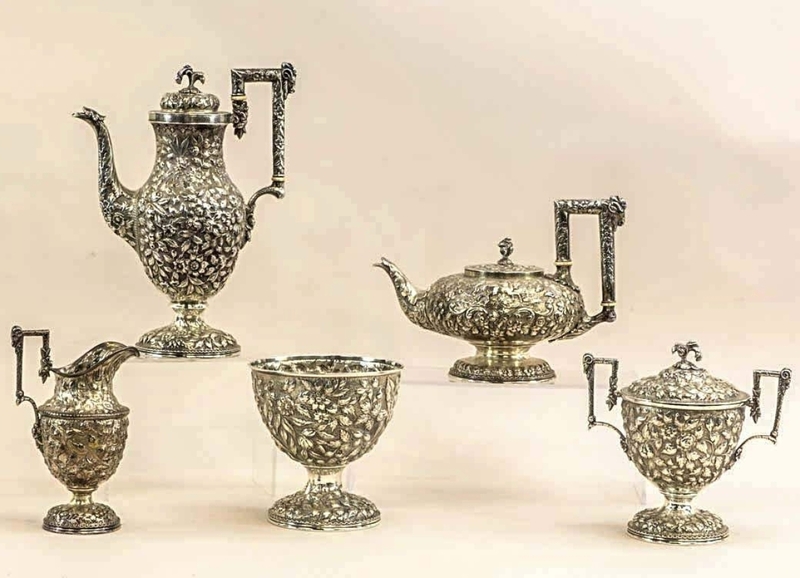 The auction comprised more than 250 lots and featured a collection of silver dating from the early Nineteenth Century to the mid-Twentieth Century. A select addition to the single-owner collection was a Nineteenth Century S. Kirk & Sons coin silver repoussé tea set that finished above its high estimate at $4,428. For more information, www.nesteggauctions.com or 203-630-1400. MONROVIA, CALIF. – Moran’s biannual California & American Art Auction on March 27 was a standing-room-only event, with heavy telephone bidding adding to the action. 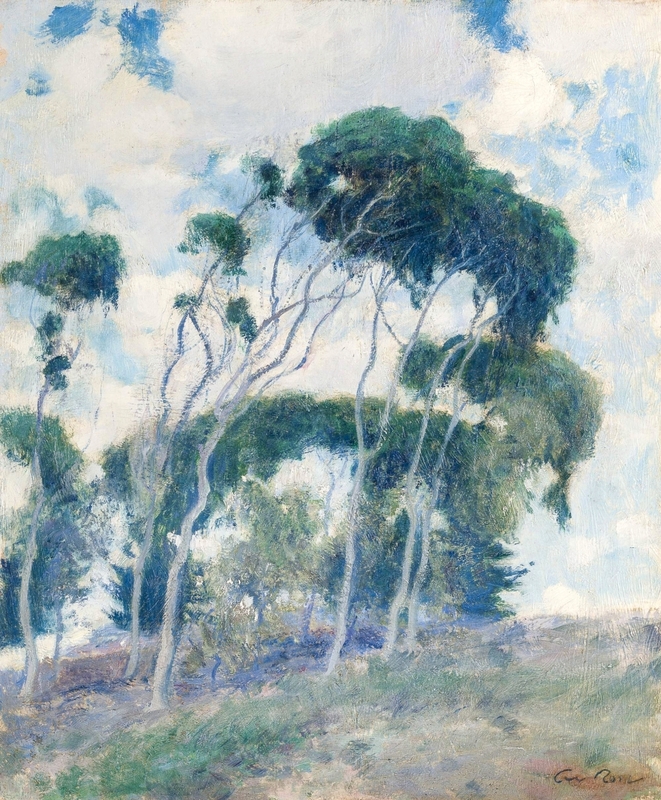 Guy Rose’s oil study for “Windswept Trees, Laguna” saw bidding between two attendee and two telephone bidders that was fast-paced. In the end, the auctioneer facilitated a protracted bidding war between the two buyers on the telephone, with the bidding topping out at a very healthy $168,000, earning top-lot status for the evening. For information, www.johnmoran.com or 626-793-1833. PASADENA, CALIF. – A successful sale was conducted on March 25 by Treasureseeker Auction. Topping the event was a Tiffany Studios Mosaic match holder selling for $8,400, while a large Goldscheider “Bedouine” bust realized $3,200 and a rare Steuben eagle pedestal centerpiece brought $1,875. An oil painting of a bulldog and pups signed R. Atkinson Fox was bid to $5,937. Most interesting, however, was a rare Teco vase (shown) that was purchased by a gentleman for $6,250. The buyer lives in the home of the maker Simon Gates and told the auctioneer that the piece is going back in the same spot they had it all those years. For information, www.treasureseekerauction.com or 626-529-5775. ONLINE – Locati LLC of Maple Glen, Penn., offered an online auction March 5-19 that included fresh-to-the-market estate jewelry with Victorian and Art Deco examples, fine art and decorative art. Many pieces had a local appeal. 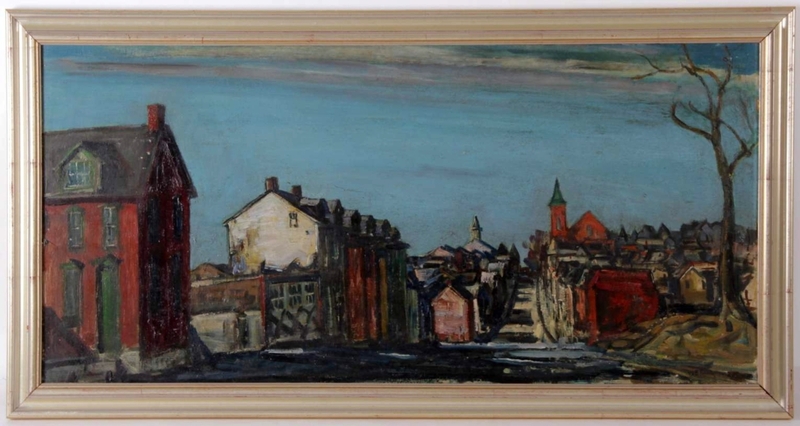 For example, an oil on Masonite of an Allentown, Penn., street scene by Walter Emerson Baum (1884-1956) sold at $3,872. “This sale had some nice surprises, including a good French jewelry casket and an Albrecht Duerer etching,” said Michael Locati, co-owner of Locati LLC, “but it was the Baum painting that topped the day.” For information, www.locatillc.com or 215-619-2873. NEW YORK CITY – Institutional purchases dominated the buying field at Swann Galleries’ auction of printed and manuscript African Americana on March 29. The top lots of the auction were almost entirely manuscripts, archives, early photographs or otherwise unique material. A large percentage – four of the top five, and 13 of the top 20 – will be joining public collections. An archive of six letters by Frederick Douglass that had remained in a family collection since their receipt, led a significant selection of material related to the abolitionist. A highlight was a signed cabinet card with his photograph, taken by George Kendall Warren. 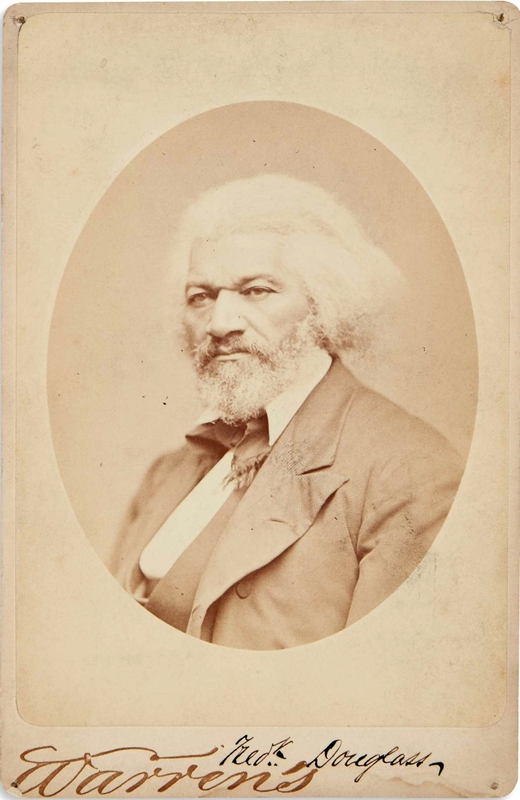 The image was used as the frontispiece for his third autobiography; it was purchased by an institution for $30,000, double its high estimate, and a record for a signed photograph of Douglass. For information, 212-254-4710 or www.swanngalleries.com. HONG KONG – Bonhams Chinese paintings department offered 20 pieces of modern Chinese works never before offered at public auction in the Chinese paintings sale on April 3. 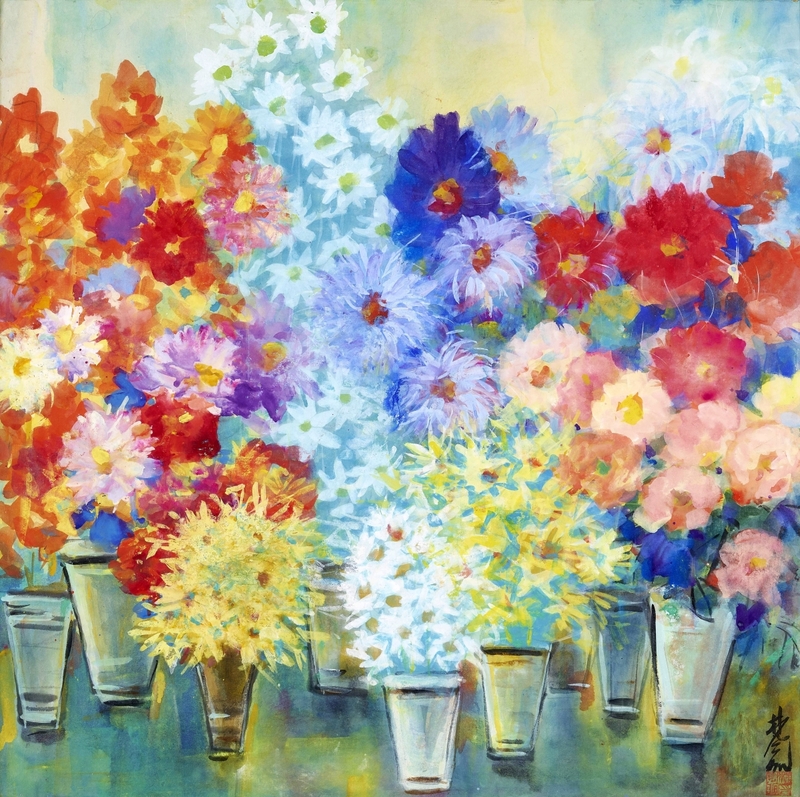 Lin Fengmian’s (1900-1991) “Vases of Flowers” from a private collection in Asia was once owned by the famous Suzhou doctor Chen Mingzhai (1911-1997). The piece’s vibrant colors are an ode to life’s energy and possibilities, which are readily felt by everyone privileged enough to see it. It sold for $394,969. For information, +852 6892 1171 or www.bonhams.com. SOUTH PARIS, MAINE – Auctioneer Paul Arsenault offered a great Maine collection at his gallery on March 31 comprising country furniture, paintings, rugs, baskets, doorstops, stoneware and more. 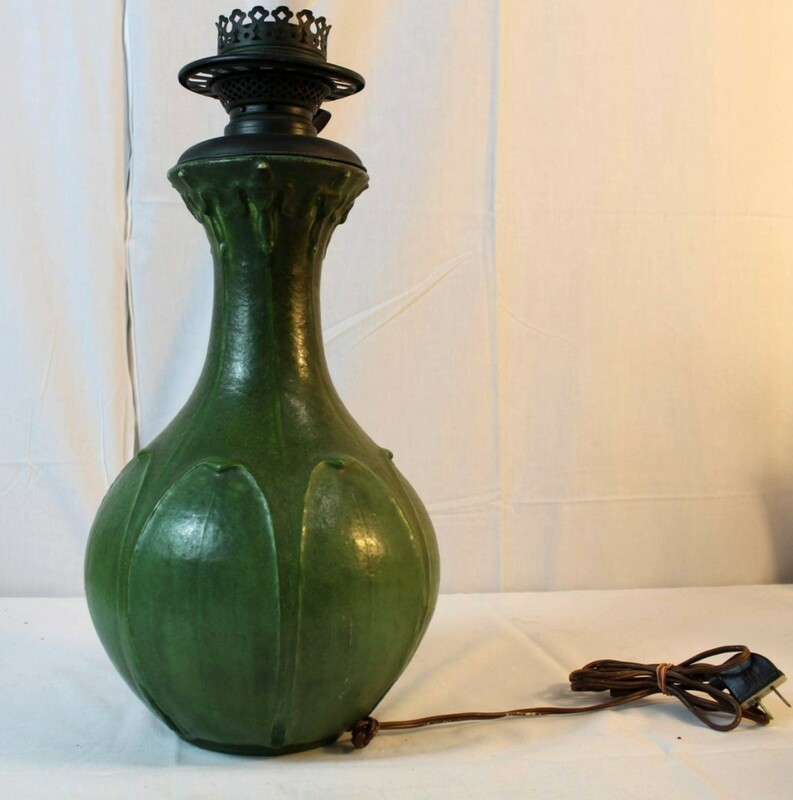 A Grueby vase that had been tuned into a base for a lamp (shown) brought $3,100, while a two-piece root set claimed the same amount and a red cupboard was bid to $1,900. “It was a good sale,” said Arsenault. For information, 207-576-7377 or email seaman57211@yahoo.com. SPRING CITY, PENN. 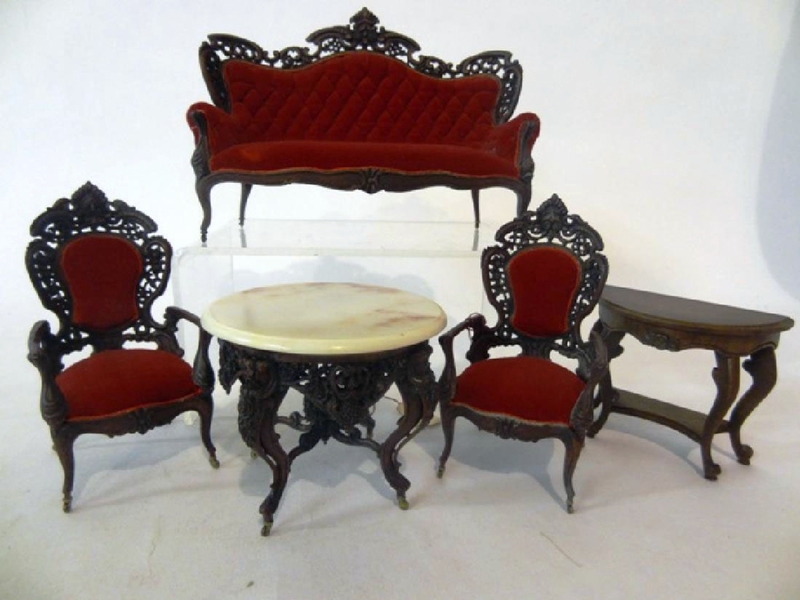 – A five-piece parlor set of dollhouse furniture, made in the Belter style by Hermania Anslinger and once owned by the Carole Kaye museum, was one of the top-selling lots at Ron Rhoads’ March 30-31 dollhouse and miniature auction. Believed to be one of only two sets ever made by Anslinger, the lot carried an estimate of $5/900, but interest quickly pushed bidding to close at $4,720. For information, 610-385-4818 or www.echant.com.